I agree with this, it looks a little strange how it is now. ok ok , maybe more simples shapes would do . I have a request, but I feel its too small for the suggestions forum. Can the captain please have a voice com option with a reference to the Monty Python Parrot Sketch? And if you dont know what that is, go look up Parrot Sketch on youtube. First of all congratulations to you and your wife. Second, good Lord that chin is huge! I hope that's a beard! Its a beard, it comes fully loaded with a 'beard sense'. 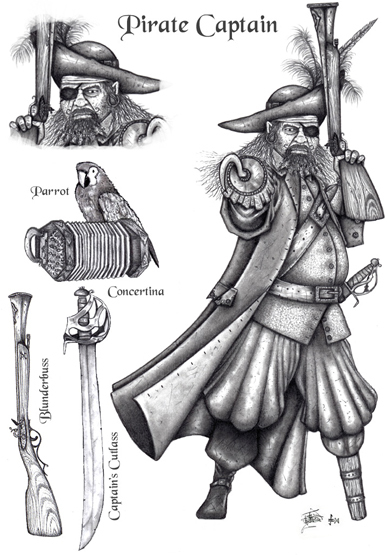 Orl, when are you going to change the peg leg? I'm dying to see this model with the peg leg a little different. I was hoping for it to look a lot like the one in the concept art, but you don't have to do that. You can just remove that rubber stopper thing at the bottom of the peg. Chill! Give the man some time to breath. Let him finish up the archer first, before he starts messing around with LeChuck here. I know, I'm just anxious. We truely appreciate feedback especially in a positive note about our creative talents and works. We need to all keep in mind though, that Orl will make any changes when he gets to it and does not need to make changes because forum goers wish it. 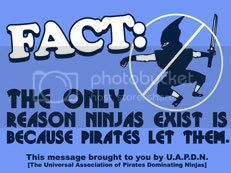 In the case of the peg leg it is understood, but keep in mind the dev team has their hands full with many jobs at once. Odd that I didn't notice this until now. Any word on the parrot sketch voice com? The parrot sketch was funny, but what would the voicecom say? I dont know, ill leave it to the professionals(aka the Dev team). FYI - We already have a parrot actually. Its even in the game if you know certain spawning commands and have sv_cheats enabled. whats the entity name of the parrot? i wanna see it so bad !!! Where'd Orl go? He's a modelling genius and he still has some finishing touches on this model and the Archer! Maybe he's doing a lot of the "baby stuff". hold down , and feel a reenactment of the birds by Alfred Hitchcock. BTW what happened to the lava effect you showed in the video? and you decided against using the extended phong shader on knight? Its broken and the author will not respond to emails. See the thread on hl2world for more details. I'll work on those models this weekend. Good to hear that. Can't wait to see what you do with these 2 models, the Archer and the Captain. You should really do the viking Huscarl model after finishing the captain and archer, you'd probably make him look real cool. I'm sure hes planning on this. The Huscarl is already finished. The model was done by Jrocket and believe me it rocks ! Maybe he'll post a few pics soon. PLEASE! Show the huscarl to us! Don't make me beg, oh god, I am already begging! PLEEEEEEEEEEAAAASSEEE! all those were on the Captain in PVK, except for the eye patch. 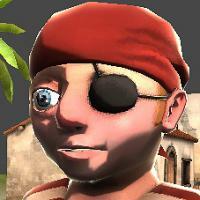 I think it's fine, since the Captain has been around in many battles... but the Skirmisher already has an eye patch... I'm ok about it with or without. I wonder if he gets handicap parking?